Home News	A suit that doesn’t merely look smart — it is smart. A suit that doesn’t merely look smart — it is smart. Wearable devices are all the rage with future-friendly individuals. Think Nike fuel bands masquerading as innocuous bracelets until they flash your step count or calories, smart watches that can talk to you and Google Glass. The trend has so far been leaning towards unobtrusive technology that fulfills its role while eliminating clunky jetpacks and blinking lights. Montreal’s Heddoko is a sleek new start-up banking on this idea of wearable technology, except instead of aiming small, they want to adapt it to a full-body experience by combining motion-capture technology pioneered by Hollywood and the gaming industry to create the world’s first athletic smart-suit. By embedding motion sensors — originally used for the green screen or Wii — to precisely capture how your body is moving and combining it with some app wizardry, Heddoko’s smart-suit will help athletes know exactly how their exercise regimens are progressing and help make workouts better and more efficient. CEO Mazen Elbawab has years of experience under his belt working for Ubisoft and Microsoft, not to mention a consulting career. He helped develop the Kinect system of motion sensing input devices that could read user movements and voice commands. The time spent perfecting such gadgetry also gave him a perspective on how to take it further. His invention probably won’t replace the physical presence and personalized expertise of a human coach, but it won’t be too distant of a second best. Just think: instead of trudging out on a cold winter’s morning to hit the gym or commuting to yoga practice, you’ll be able to slip into a comfortable smart-suit without ever stepping outdoors and have feedback on hand. That yoga pose or martial arts sequence? Your phone (or, supposedly, any compatible display) will tell you how to nail them both and offer the visuals and statistics to take things to the next level. Ultimately, Heddoko has ambitious plans. The niche market at the moment will be athletes willing to spend an estimated $400 for the final product, but Elbawab believes there’s no reason why the technology couldn’t be adapted to the medical field — where the suit’s sensitivity could help with physiotherapy and healing injuries — or beyond. Though Elbawab agrees Heddoko has done much, the technological and business hurdles have been substantial. With the help of established Montreal entrepreneurs and investors, Elbawab’s team has ballooned to 15 engineers, businessmen and programmers. He has partnered with Concordia’s District 3, the meeting place for creativity, entrepreneurship and engineers to bandy about ideas, network and collaborate. “In a matter of four months we went extremely far. People usually struggle in building a first prototype,” he said. Heddoko’s proof of concept — a single working arm — managed to break it into the top three hottest inventions. The group behind the Heddoko. The technological side of things hasn’t been easy. “We can talk about the engineering difficulties for hours,” he said when prompted to elucidate. The range of conditions in which his invention would have to perform flawlessly is daunting. As anybody from a NASA scientist piloting a rover on Martian soil to a Vietnam veteran hoping his firearms don’t get jammed can tell you, everyday conditions can be the hardest to surmount — and the fancier the technology, the bigger the problems. A suit would have to perform as well in -20 celsius temperatures as 30 celsius, and be expected to go from one to the other, day in day out. A shirt can be washed to expunge the accumulated sweat and smells your body expels over hours — a mesh of circuits and sensors cannot. Another challenge has been optimizing sensor placements to their ideal points on the human body to accurately capture movement, a complicated task when you realize every part of our body is constantly changing in three dimensional space in relation to any other point. While Elbawab admits much of the technology already exists on the shelf, that doesn’t mean it’s efficient or specialized enough for his purposes. Case in point: they’ve been in partnership with another start-up solely focused on the battery system that will deliver the juice to make the suit function. Elbawab hopes the ideal battery will have enough power on a single charge to last an entire week. Finding investors will be just as difficult, if not more so. Speaking from experience, Elbawab knows the product, no matter how attractive, won’t sell itself. “I went back and forth a lot,” he said about his strategy to bring in money. He tried selling the technology, appealing to potential buyers on his level, the level of gadgetry and technical ingenuity. He said people didn’t understand it. Only when he found a way that enabled his listeners to relate on the athletic level did he get the support no amount of cool technology could. It was a matter of speaking to people on their own level, and knowing the right people. “You have to know what problem you’re trying to solve with that technology,” he said, and outlines how he envisions, in his words, democratizing the gym lockers of athletes with a technology that has up until now remained confined to Hollywood. Thankfully, Montreal’s prime location as an attractive hub of software and programmers will make things easier. District 3 has given him the chance to attract many talented young individuals, Concordians above all, to his project in exchange for the mentoring and intense start-up workload regular interns wouldn’t get in large corporations. There are further challenges ahead. “Once we get to the prototype level, 99 per cent of the innovation will come from the software,” said Elbawab. He aims to finalize a functional prototype by the end of 2014 and launch a crowdfunding campaign. 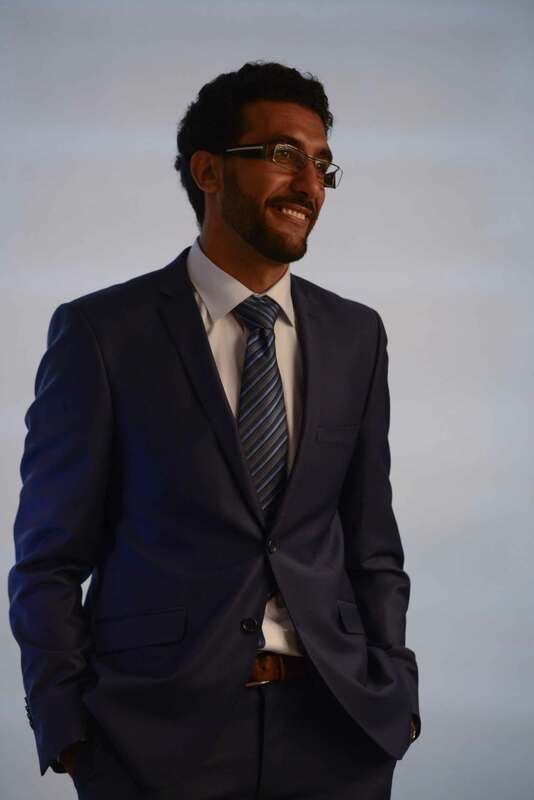 Until then, Elbawab is performing market research to determine which crowdfunding platform will be ideal for his purposes, and said Montreal will be the first place to have access to the suits.